Callie Bertsch is Forest Habitat Coordinator for the American Bird Conservancy where she supports the Wisconsin Young Forest Initiative. Callie earned her Master of Forestry by researching the uses of non-timber forest products among three different people groups living in Southwest Bulgaria. A graduate of Michigan Technological University’s Masters International Program, Callie served as a Peace Corps volunteer in Bulgaria before joining ABC. Furthermore, she is a certified naturalist and has worked as an environmental education intern. 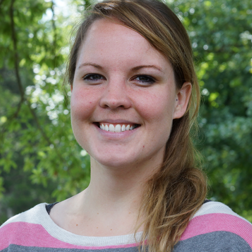 Prior to ABC, Callie worked on Farm Bill programs with the NRCS in the Upper Peninsula of Michigan as well as on a climate change adaptation plan for the local conservation district. Even though she acknowledges many good men in the profession, Callie has already confronted some sexism in her career, so in this episode, she offers some advice for women professionals in this regard and those working in remote areas. [2:25] How did Callie get started in forestry? [5:20] When Callie was in the Peace Corps, she went to Bulgaria, and wrote her thesis on the use of non-timber forest products. [7:45] Callie wasn’t sure what she wanted to do, and worked a variety of different jobs before deciding on forestry. [10:00] When Callie was in the Peace Corps, what was she most proud of? [11:15] Does Callie still speak Bulgarian? [15:45] What is the Young Forest Initiative about? [18:50] What has Callie learned over her very interesting forestry career, about leadership and working with others? [20:35] You might deal with men who may act as though you don’t know what you’re talking about. Don’t take that personally. [21:05] Unfortunately, women are still being treated this way in the profession. [22:50] A woman must always be on guard, especially when working in remote areas. [25:20] Callie’s rule is to always trust your gut. You don’t need to explain yourself to others about why you’re uncomfortable. [27:00] Always let your teammates know where you’re going! [28:10] Shoutout to some of the fantastic men working in forestry today. [33:35] How can men better support their female counterparts? [38:55] What are Callie’s thoughts on the future of forestry? [45:40] You have to learn your confidence. [51:20] Tom’s Leadership Tip of the Week!